Lately, and for all sorts of reasons, the Israel-Diaspora relationship seems to be under continual review and re-evaluation as world Jewish leadership confronts the question of how to further the imperative to renew the link to Jewish peoplehood and Israel for the next generation. The Jewish Agency’s Global School Twinning Network includes a wide variety of schools: Jewish and non-sectarian; schools from different Jewish streams; elementary, middle and high-schools; day and afternoon schools; schools from different sectors of the Israeli population, and more. To date, 650 schools in partnerships spanning the globe are engaged in active twinning programs. The dispersion and variety of Jewish schools worldwide is an ideal platform on which to build twinning relationships. The goal is to bring these schools closer to Israel and each other; to bridge cultural divides and join teachers, students, and institutions that are spread out geographically on a virtual basis . 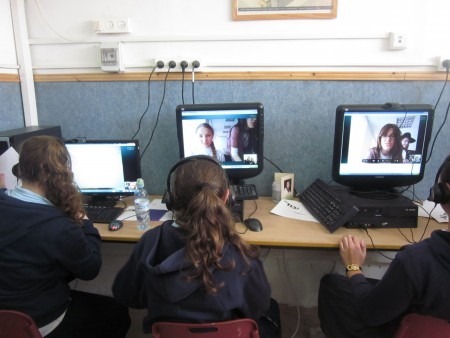 During the past 2 years, the global School Twinning Network, with the support of the Pincus Fund, and as collaborative initiative of the Israeli Ministry of Education, the Jewish Agency and Beit Hatfutzot, created a virtual, global platform for sustaining meaningful relationships, between Israeli and world Jewish students, educators, schools and schools communities was created. engagement among educators throughout the world in a meaningful professional and personal interaction through online forums, chats, media sharing, questionnaires etc. social networking by active participation and sharing amongst partnering communities, their educators and their students. The project enhances the process of building living bridges among educators from partnering school communities and has become a primary resource for their shared educational activities. The network operates through a website and an on-line virtual platform with three main components: knowledge, practice and interaction. Each section includes original materials as well as materials extracted from edited and selected educational and general sources. Knowledge: a portal to information about the Jewish people and Israel; this section includes highlighted links to information, experts from recent research, links to major news and current affairs amongst the Jewish people and Israel. Practice: As a central platform for school twinning this core section acts as a portal to the educational activities, lesson plans, educational events and initiatives spear-headed by the twinning schools. A “blog-spot” for suggested activities written and provided free by the online team for twinning schools. Interaction: a safe and monitored meeting and sharing virtual place for the network. This section includes an arena for personal and public conversation as well a set of tools most frequently requested by school twinning educators (e.g. multi-user video-conferencing, questionnaire tool and more). This section also includes an online interactive ‘gallery’, showcasing the successes of the twinned schools as well as each individual school, in the form of YouTube clips, PowerPoint presentations etc. This area also triggers further engagement through the website, for example: calling for “best Rosh HaShana YouTube greetings”, “The most fantastic Yom HaAtzmaut celebrations”, “Lets Plant a tree together” etc. The project focuses on twinning schools from Latin America and Former Soviet Union with Israeli counterparts. Together they are developing shared projects and curricula. The schools testify that through contact with an Israeli school, they are able to turn Israel from an abstract, distant concept existing only in books / media into a real, live, vibrant country that is meaningful to the school’s community. They also indicate that the project enables them to expand their school’s knowledge about Israel and that it develops an emotional relationship with the State of Israel and its residents. The Israelis schools indicate that the program enriches and expand Israelis’ knowledge of, and familiarity, with Diaspora Jewry, and the different streams of Judaism and pluralism in Judaism. Being an international communal endeavor, this project taps into the realization that the future of the Jewish people relies substantially upon communities’ ability to create intertwined connections through a meaningful Mifgash, to provide mutual support in tumultuous times and to take pride in shared achievement . PreviousA-Gender: Jewish schools – Are we in danger of secluding our children from society?